A wrapper analysis pass for the legacy pass manager that exposes a MemoryDepnedenceResults instance. Definition at line 522 of file MemoryDependenceAnalysis.h. Definition at line 1771 of file MemoryDependenceAnalysis.cpp. 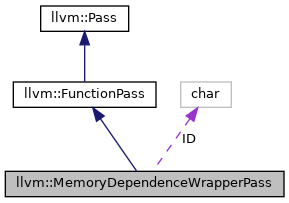 References llvm::PassRegistry::getPassRegistry(), llvm::initializeMemoryDependenceWrapperPassPass(), and ~MemoryDependenceWrapperPass(). Does not modify anything. It uses Value Numbering and Alias Analysis. Definition at line 1781 of file MemoryDependenceAnalysis.cpp. References llvm::AnalysisUsage::addRequired(), llvm::AnalysisUsage::addRequiredTransitive(), and llvm::AnalysisUsage::setPreservesAll(). Definition at line 540 of file MemoryDependenceAnalysis.h. Clean up memory in between runs. Definition at line 1777 of file MemoryDependenceAnalysis.cpp. Pass Implementation stuff. This doesn't do any analysis eagerly. 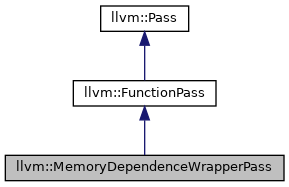 Definition at line 1813 of file MemoryDependenceAnalysis.cpp. Definition at line 526 of file MemoryDependenceAnalysis.h.